Andy is my darling too! Title: How much do they cost? I can't get enough of Melissa's giant woven tapestries. 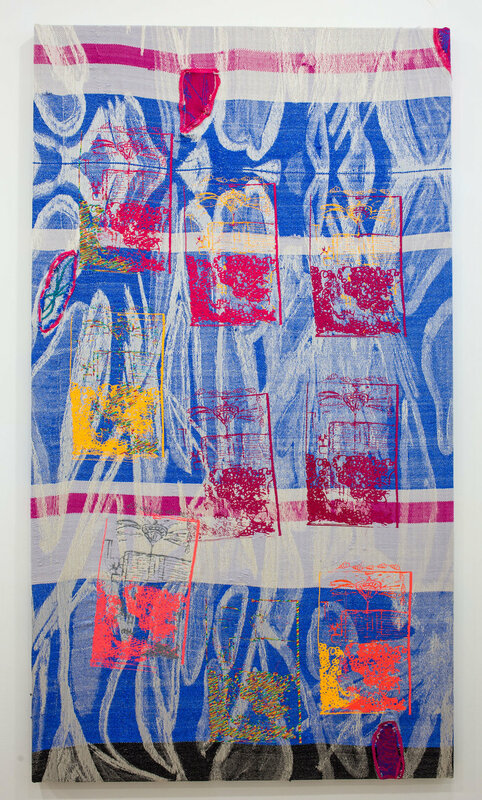 From her artist statement: "Leandro's woven and embroidered surfaces explore her composite cultural identity through means of intuitive mark-making. Reflecting on her past and present travels, she considers the impact of these environments on the fragmentation of identity and place." Few artists can paint more human imagery than the late Joan Brown—especially with her human-animal hybrids. This art potion made of horse hair, chains, and vinyl has us under a spell! According to Trish's artist statement, her work aims to stir feelings of "domestic ritual, fetish, and a modern tendency towards private totemic monuments." Guy's intimate, domestic imagery feels at once digital and painterly. Not to mention Guy's eye for color and plant life woos my little millennial heart. Deborah's work champions the power of young Black girls. All I can say is hooray! Hooray! More! More! I can't get enough. "Having one’s identity dismantled, marginalized, and regulated to non-human status demands action. 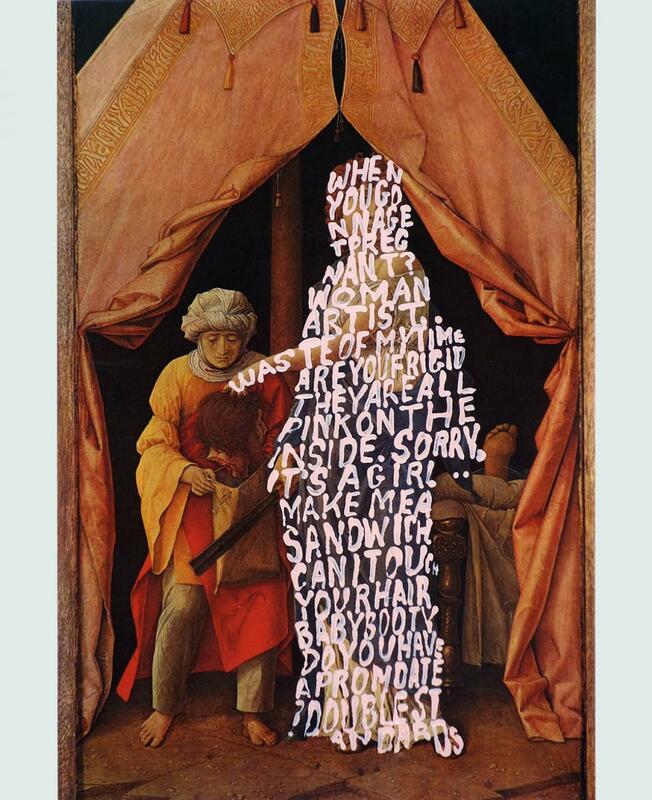 This led me to critically engage image-making in art history and pop culture, and ultimately grapple with whatever power and authority these images have over the female figure." In her latest series, The Ebbs And Flows of Heartblood, the Latvian artist Jana Brike will leave you actually longing for the the scraped knees, baggy swimsuits, and armpit hair of your long lost post-pubescent summers. Be still my heart. Alex's paintings should be made into an animated feature film, with no dialogue (since there are no mouths), featuring lots of dreamy hipster music by Californians. 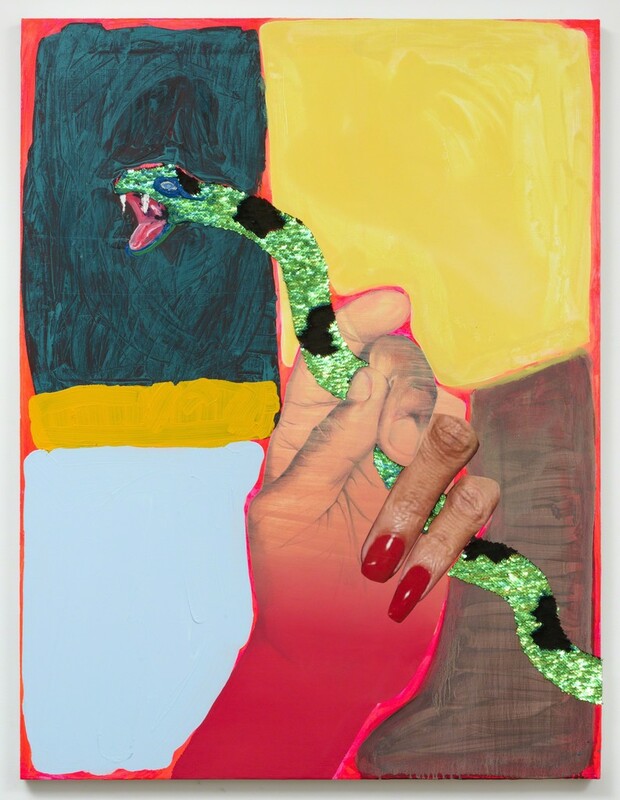 Monica Kim seizes the female body from the likes of Matisse and Gauguin and forges a new a female gaze for our ridiculous era. Andrea Canepa reorganizes and reimagines ordinary imagery and extraordinary ideas, making us see that we do not know what we think we know. 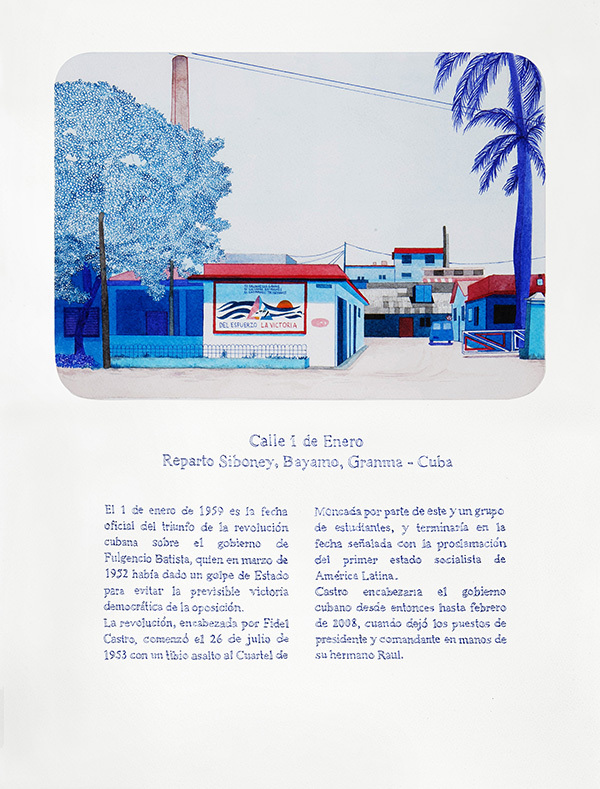 From her artist statement: "This series of 365 drawings shows 365 streets in Latin America named after each date on the calendar. Each drawing shows the image of the street and a text with its name, its location, and a small paragraph that explains the event after which the street is named." These massive felt pieces are incredible in real life. Pattern! Color! Pattern! Color! From Jody's artist statement: "Paulsen’s eye-popping creative output sequesters, multiplies, and reassembles the conventions of consumer society, offering viewers a glimpse of a far more individualized and fluid identity." Mickalene The Great reframes Black female identity. Long may she reign. Don't you also love her paintings? 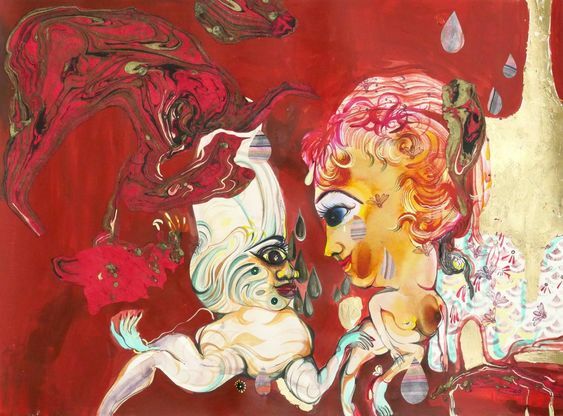 Born in India, raised in London, and now residing in New York—Rina Banerjee brings a global perspective to her art, a "willingness to close the gaps between cultures, communities, and places." But best of all, Rina's titles could be flash fiction in their own right. Title: All heart and wonder the future came to her like thunderous lava, she leaped while it seeped into places hostile and thence explosions placed her away from him, his anger waked her as survivor. Lissa Rivera is fascinated by the evolution of identity, sexuality, and gender in relationship to material culture. The works below center on her partner, who poses in feminine dress. "It is important to show his femininity as strength. I want to feel empowered as well, and to have an intimate muse. Together we investigate feminine fantasies presented throughout the history of photography and cinema." 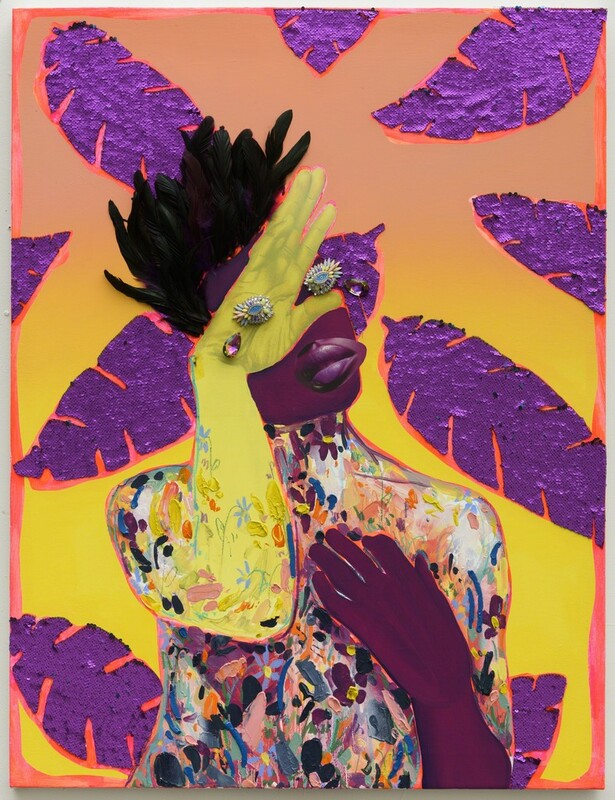 Devan's magical mix of neon, sequins, glitter, and rhinestones create masterful figurative paintings that explore both the celebration and silencing of queer culture and sexuality. Lava's portraits weave together red hot feminist discourse, secular and religious ideas of the sacred, and African American devotional and protest traditions. Her portraits force us to reconsider the history we think we know. The economy, color, and humor behind these lovely paintings take inspiration from the every day, such as clothing, facial expressions, or a simple gesture. Bisa's giant and beautiful quilts draw on the African American quilting tradition. From her artist statement: "My subjects are people I see every day. I have always been fascinated by the nobility of everyday people. They are the royalty who walk among us. We have known them from the days when the people could fly. My materials can be found in all of our closets." Lisa's hot pink installation stopped Pulse showgoers in their tracks. This classically trained painter's genius use of color and abstraction toys with what her artist statement calls "the inevitable and irresistible desire to escape prepubescence with the trying on of the adult person." The word iconic follows Betty Tompkins around. A woman once scorned by the feminist movement for her "pornographic" source material now deserves her rightful throne as our art queen. If you've read this far, do yourself a favor and read the words on these paintings carefully. artists give me hope for 2018.